We know Galveston and we call it home! Staring out your office window at the concrete jungle, flashes of faraway paradises flit through your mind. You feel the sand between your toes as you imagine sipping on a cocktail while tropical breezes whisk your worries away. While you can spend thousands of dollars traveling to a resort, be kind to your wallet and take advantage of the paradise in your own backyard: Galveston Island. To convince you, here are some of our favorite things about the island we call home. A visit to Galveston Island is incomplete without a trip to the beach, and with so many options, you could easily spend your whole trip here! The beachfront along Seawall Boulevard, Galveston’s most popular beach, offers 10 miles of soft sand. When you tire of the ocean, rent a bike and take advantage of the nation’s largest continuous sidewalk that runs alongside. Galveston’s family-friendly beach, Stewart Beach, offers concessions, chair and umbrella rentals, volleyball courts, and more! If you’re looking for a party, East Beach is for you. One of the only beaches on the island to permit alcohol, East Beach’s stage hosts live music events and festivals throughout the summer. Finally, Galveston Island State Park, located on Galveston’s west end, provides a variety of outdoor clinics including kayaking, bird watching, and fishing. Activities tend to fill fast, so be sure to sign up in advance. The historic Strand, named for the street on which it resides, is Galveston’s downtown area. While much of the island was destroyed in its infamous hurricane in 1900, many of the buildings on the Strand survived, leaving a paradise for architect lovers. Wander the piers for a view of the Elissa, one of the oldest in-use ships, grab some tasty treats at L.A. King’s Confectionary, and pick up some souvenirs at one of the many boutiques. As you explore, be sure to stop in at one of The Strand’s fantastic restaurants. For nightlife, the Strand is also home to some of Galveston’s most popular bars. In between the fun on the beach and the great local food, find time for some education. Learn about sea life, discover adventure on the ropes course, or cool down in the water park at Moody Gardens. Want to dive into history? Moody Mansion offers tours of the beautiful home of one of Texas’ most influential families. 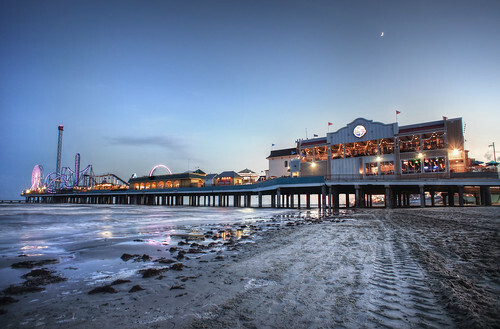 A quintessential Galveston landmark, historic Pleasure Pier offers exciting roller coasters, carnival games, and the perfect backdrop for family photos. We could list the endless offerings for days, so be sure to stop by the Galveston Island Visitor’s Center for an extensive list; you’ll find something for even the ficklest member of your group! Throughout the year, Galveston throws a number of events and festivals. Beer lovers find their paradise at the Brewmasters Craft Beer Festival at Moody Gardens where you can be the first to try new selections from Texas’ best craft breweries. Father’s day weekend, taste some Southern soul food at Galveston Cajun Festival, celebrating the best of Texas- and Louisiana-style cuisine. When much of the country huddles in their homes during the frigid month of February, Galvestonians throw one of their biggest parties during Mardi Gras. Emerge from your den and enjoy outdoor entertainment, soul-enriching southern food, and booths from some of Galveston’s local businesses. Finally, find The House Company’s beer booth at Dickens on the Strand. Thinking about visiting Galveston this Spring Break or summer? Let The House Company take care of you! Contact us today to discuss vacation rentals.